It has been decades since J. Paul Raines first donned the red suit at a church program. He was hooked. Eventually he began making numerous appearances each Christmas Season. As the requests grew, he realized he could not keep up with them all and founded Santa Claus and Company to fill the demand. Raines began teaching Santa students a four hour course dubbed “Santa’s Workshop 101” and supplying Santas to Phoenix, Las Vegas, and Denver. 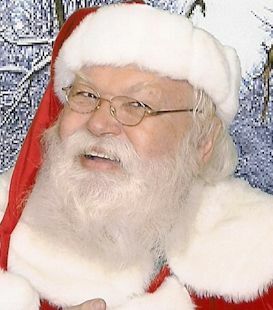 Besides his duties with Santa Claus and Company, he is very active in the world-wide Santa Claus Community, serving on many group boards, and is a mentor to many of the new Santas that join. He also appears many times a year for special events such as Christmas in July promotions. And as in the many years before, each Christmas Season, Raines dons the red suit for major holiday events with many local and state officials for tree lighting ceremonies, parades, and organizational appearances.